Global packaging leader MWV faced a challenge: it needed to develop innovative, consumer-driven secondary packaging solutions 33 per cent faster to address fast-moving consumer goods manufacturers’ challenge of speed to market. It chose Dassault Systèmes’ 3DEXPERIENCE platform based on V6 architecture for every step of the package development process, from brainstorming marketing concepts through 3D design, simulation and manufacturing. With the 3DEXPERIENCE platform, MWV has compressed the packaging timeline from 18 to six months by developing more efficient business processes and streamlining 3D data from product design to manufacturing. Many beverage companies expect a package that is low-cost and efficient to produce and deliver. 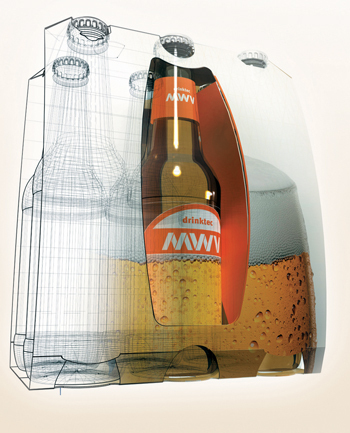 MWV, a worldwide leader in packaging, goes far beyond that simple formula. Its market insight and innovative solutions make it a packaging partner of choice for leading beverage brands around the world. In 2011, MWV launched Insight to In-Market, a fully integrated approach designed to provide solutions that differentiate on shelf while providing customers with speed to market, flexibility and agility. The Insight to In-Market approach is rooted in consumer and market insights. The findings help identify opportunities to develop engaging packaging designs that strengthen the brand experience and loyalty. “For our customers, the package is becoming an integral part of their equity. They’re increasingly interested in how the entire package can help them increase the consumption of their product,” explained Bill Cecil, vice president of machinery and automation for MWV’s beverage business. To support its Insight to In-Market strategy, MWV added experts from well-known global CPG companies with backgrounds in consumer insights, market intelligence and branding. The results of their work are brand-centric packaging strategies that meet and exceed expectations for the consumer, the retailer and the brand. Efficiency of the whole process is critically important. Typically, the timeline for new package development ranges from 12 to 18 months, with the norm being closer to 18 months. “Our goal is to go from 18 down to just six months,” said Cecil. How will MWV achieve that? Through collaborative design, linked directly to manufacturing, all enabled by Dassault Systèmes 3DEXPERIENCE platform. The rollout started with a small pilot programme in France, supported by Dassault Systèmes business partner Keonys, then involving design teams in Australia, the US, China, Germany and Brazil. Designers in the various locations worldwide can work together smoothly and collaboratively using the platform. It all starts with one-on-one meetings with clients. MWV and its customers used to show up for such meetings with little more than a sketchpad. Now, they bring the full force of the 3DEXPERIENCE platform for collaborative innovation. A primary solution that has made an impact is Concept Development, part of the Perfect Package Industry Solution Experience. “In the past, we would sketch on paper or a white board or a flip chart. It was a great creative process. But when we were done, we didn’t have anything that immediately translated to a final design,” noted Cecil. But today, using concept development in those brainstorming sessions enables the MWV team to evaluate a broader range of design alternatives. They can rotate an evolving model and explore options with the customer, all in 3D. They can save an early design option as a base option, then move on to numerous alternatives – from a 3D sketch concept to tested, customised packaging renders in only 30 minutes. Working in 3D not only allows designers to better visualise the package they’re creating, but it also enables a smooth and rapid transition to manufacturing that package. Once the design itself is finalised, MWV develops machines to convert raw materials and create the package. “It’s a revolution,” said Louret. “From the moment that we develop the package in three dimensions, it’s fully compatible with the machines. We can take the 3D package and put it directly into the machine and there’s no reprocessing to do. It is a huge step forward for our engineers.” Simplification. MWV’s move to the 3DEXPERIENCE platform also gives it added versatility in designing and manufacturing its packaging machinery for 21st century customers. “Our latest generation of machinery is based on the idea that our customers will need flexibility and agility to adapt as the market changes,” explained Cecil. In the past, many of the operations required to produce a carton have been designed into the machinery itself. But modern machines are software-driven, so MWV utilises manufacturing software and embedded robotics to update the machines. In addition, testing software modification at the customer’s manufacturing site would be impractical. 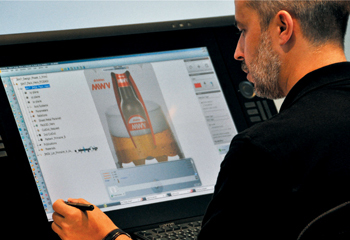 So MWV maintains a virtual copy of the packaging machine in the 3DEXPERIENCE platform. As MWV modifies the software to produce a new package, the company tests its performance on the virtual machine. The platform simulates the entire production process, including optimal die cutting and palletisation. Cecil points out that MWV’s integrated, end-to-end approach to packaging – from consumer research through product design to manufacturing – makes it a perfect fit with Dassault Systèmes. Those interested in further information on Dassault Systèmes 3DEXPERIENCE software for consumer packaged goods in the Middle East region may contact the authorised solutions partner D2M Solutions FZE www.d2m-solutions.com.